Address: Agonal,16, Urbanización Matagorda, Puerto del Carmen (Lanzarote), Islas Canarias. Located 400 metres from Puerto del Carmen's Matagorda Beach, Aparthotel Costa Sal has a sauna, paddle tennis court and 2 swimming pools. Most apartments have a private balcony or terrace. Set in landscaped gardens, the Costa Sal apartments have simple, bright décor and are air conditioned in summer. They all include a flat-screen TV with international channels. Guests can enjoy meals in the Costa Sal's restaurant or outside on the terrace of the on-site snack bar. The aparthotel also offers a supermarket and a self-service laundry room. Staff at the 24-hour reception can arrange currency exchange and bicycle or car rental. Free parking can be found nearby. 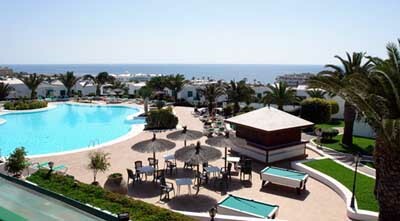 The Costa Sal Aparthotel is around 5 km from the centre of Puerto del Carmen. Lanzarote Airport is a 10-minute drive away. Please inform Costa Sal Villa´s & Suite´s in advance of your expected arrival time. You can use the Special Requests box when booking, or contact the property directly with the contact details provided in your confirmation.